While this 25th December has brought us festive Nintendo Download updates, and a host of treats and discounts around the world, North American Wii U owners have an extra treat - a free Crunchyroll app to access a lot of anime, manga and Asian dramas. That'll no doubt be music to the ears of a number of Wii U owners, with the video streaming service offering franchises such as Naruto Shippuden, One Piece, Sword Art Online and Hunter x Hunter. The app itself is free, though like other TV services such as Netflix there's a subscription cost to access the content. Nintendo's press release promises "25,000 episodes and 15,000 hours of hit licensed content" to be available right off the bat for existing all-access premium Crunchyroll customers. Those that aren't members will be able to trial the service for free for 14 days, after which point it's necessary to take up the $11.95 a month service or lose access - it seems that only this top-tier, ad-free subscription allows viewing on the Wii U. At the time of writing this isn't available on the European Wii U eShop, so this is North America-only right now. Are any of you existing Crunchyroll members going to download this, or will you give the trial a spin? I will definitely give the trial a go, seeing as I just recently discovered the site. It's only a $11.95 subscription fee if you want both anime and drama streamed. It's $6.95 if you want anime or drama separately. Anyway, if you're a fan of animation in general, I highly recommend giving this app a try. There are a wide array of genres, both all ages and more mature content. I think it's pretty awesome. Happy holidays. This was such a nice Christmas surprise! I really like Crunchyroll - I buy an a-la-carte month over almost every winter/summer vacation - and I've been wanting to watch on the Wii U for ages! Definitely recommend checking out the trial if you haven't tried before - and make sure to watch Monthly Girl's Nozaki-kun! I want this in the UK. Why does America get all the good streaming apps (Netflix on Vita and 3DS, Crunchyroll on Vita and Wii U, Hulu Plus, TVii, etc.)? This means exactly what it means. @NintensityCrowds They said it's a development issue, it'll be fixed as soon as possible. or you can continue to watch everything cruchyroll has on your PC for free even on their website. I like in the US, and TVii doesn't seem do do anything. Am I using it wrong? Cool, I was hoping they'd do this. I just cancelled my CR subscription because this season was weak. @Melkac it better. i'm still gonna use the app since i'm a anime watcher that supports crunchyroll, but i'm just ticks off from the app being infirior to the other consoles. So not only do I get a Wii U this year, but a Crunchyroll app to go with it. @kensredemption Playstation platforms, Xbox One, and mobile phones and tablets all use Crunchyroll for free. 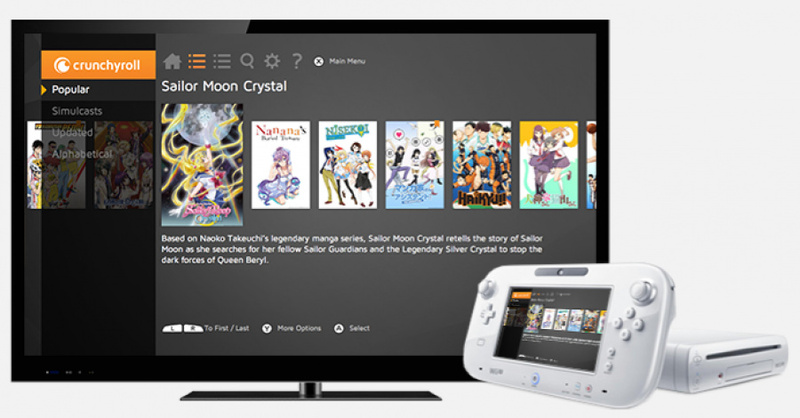 the Wii U is the only platform right now where you NEED a premium account to use Crunchyroll. EDIT: outside of the Xbox 360, which mind you is an older platform. This sounds interesting, I'll definitely use it if there's an option to watch for free with ads on. better late than never, at least they are not like those people who created minecraft and completely ignore nintendo. @Dipper723 I use it to follow my favorite football team when they are usually not aired. Any content for Wii U is good content I say! So its free on a PC, free on a laptop, free on a tablet, free on a phone, but they want you to pay to use the “free” Wii U app and you STILL don’t get dubs? Pass. It's funny that just the other day I wondered why Wii U didn't have Crunchyroll. Weird how that happens. Right after I discovered the app available on my Smart TV. @Sergio151 lol they don't, for the most parts. Most fansub groups just ripoff CR's subs, make a few incredibly stupid changes and call it a day. If you're talking about people still pirating anime...eh, the smart ones use CR. I may give this a try. I'm not a huge anime fan but I'm willing to give the fee trial a spin and see if there is enough content to win me over. Be good if it comes to UK ! Are they Dubbed or is it just Subs? @Mega719 Mostly subbed, some might be dubbed but expect subs on most stuff if not all. That's awesome, I might just check it out just to re-watch Sailor Moon again. Really love that series. This was an unexpected surprise to say the least. I use crunchy roll on my ps3, but my 32in flat screen that I have had for a good while now went out so I don't play any of my games or watch anything in my room to often because my temporary replacement tv is embarrassingly small and it would be near impossible to read the English subtitles. So being able to watch some anime on the gamepad for the time being is awesome. It is free on smartphones at least, because I have the app on my phone. You have to log in with a premium account to remove advertisements, though. I believe they said on their website that it is coming to Europe early 2015. Also they said that the reason you need a subscription is because of something with the hardware on Wii U and 360, but they are working to be able to have it for free as well. @Spanjard Don't hold your breath. It has been available for ages on north american PS3s and AFAIK it's still not available on the european PSN. Neat. I mean, I'll probably never use this, but neat. I just started my free trial but I may cancel. I think it's great for true anime fans but sometimes, I actually like the English dubs. They seem to have none of that. And I'd like to see older anime movies/shows. Particularly video game-related ones. Guess I'm just not a fan of modern anime. I join the others, this would be well wanted in Europe. Ps3 is also missing the European version. Me want. I'm very excited that CR has finally come to Wii U. Along with Netflix, it's the most valuable media subscription I keep. The price is cheap, and the content is both varied and excellent. So no free lower res viewing like on the Android app? I'll continue using the Internet Browser for all of my anime. Nah this app is filler IMO. Just checked the list and am not impressed. I'll stick with Hulu. I hope it comes for europe as well. Given my anime viewing basically boils down to Dragonball, Dragonball Z, Naruto, Spice & Wolf, Inuyasha and Rurouni Kenshin, I'll just stick to Hulu and Netflix for my anime needs for the time being. It's a nice service for people who are really into anime, but most of the series on there have not caught my interest yet. That, and Hulu has an insanely good selection of anime series and movies, plus other general shows like Star Trek and other stuff. Yes! Finally! I've been waiting forever for this! Can I pay 60$ for a years worth membership? I swear I read that some where but I can't find it now. @Nintendo6400 I don't think it's wise to name your site of choice for free streaming. Are you an undercover fed? Really? I don't think the site I use is illegal. I prefer to watch things on my PC as it is, so I won't be using this on my wii u. Besides, with a little waiting, I can watch everything that I want to for free on crunchyroll, I am certainly not the type of person that has to watch the latest episode of something the DAY it comes out. The free service will be available sometime soon. I think ps4 free came online in late October and it took xbox one till the end of November for the free service, which is ad supported. Nintendo needs to make it so that you can pay for the subscription services with eShop funds. So happy this here! Thank you, Nintendo! Thank you, Crunchyroll! This is unnecessary. You can watch anime on the Wii U web browser. Those are free plus a better selection. I have this channel on my Roku, I watch it constantly!